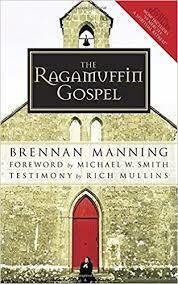 The Ragamuffin Gospel changed the way I think of God’s love. For someone who has been a Christian as long as I have, and for someone who clings as heavily as I do to my Reformed theology, that’s saying something. But this book put a big ol’ spotlight on my “doctrine” and showed me just how works-based my faith is. Again, that’s saying something. I’m not sure why it took me so many years to read it – it is far from a new book. In fact, in just a few more years, it will be celebrating its 30th anniversary. I guess I’ve heard about it a time or two, but it wasn’t until it started popping up quite regularly on one of my favorite bookish podcasts that I made a point of picking it up. I am so very glad I did. His love transcends understanding. For years I’ve used the “His justice transcends understanding” argument to deflect many things. But I’ve always I thought I “got” His love. Because it’s like my love, right? Wrong. His love is unfathomable, too. I have no idea what perfect love is except as a reflection of God. Abba just wants us to show up. We don’t have to tarry at the tavern until purity of heart arrives. We don’t have to be shredded with sorrow or crushed with contrition. We don’t have to be perfect or even very good before God will accept us. We don’t have to wallow in guilt, shame, remorse, and self-condemnation. Even if we still nurse a secret nostalgia for the far country, Abba falls on our neck and kisses us. The secret of the mystery is, God is always greater. No matter how great we think Him to be, His love is always greater.